Check back here for documentation/instructions on how to customize your dashboard and other information about the portal as we release additional functionality. 2/11/2019 @ 8:00 a.m. – The MyStanState portal has launched! 2/21/2019 @ 3:00 p.m.–The HR widget showing employee sick and vacations hours is now avalible! This new portal allows single-sign on access to over 60 different applications on campus, without asking you for different usernames/ passwords. 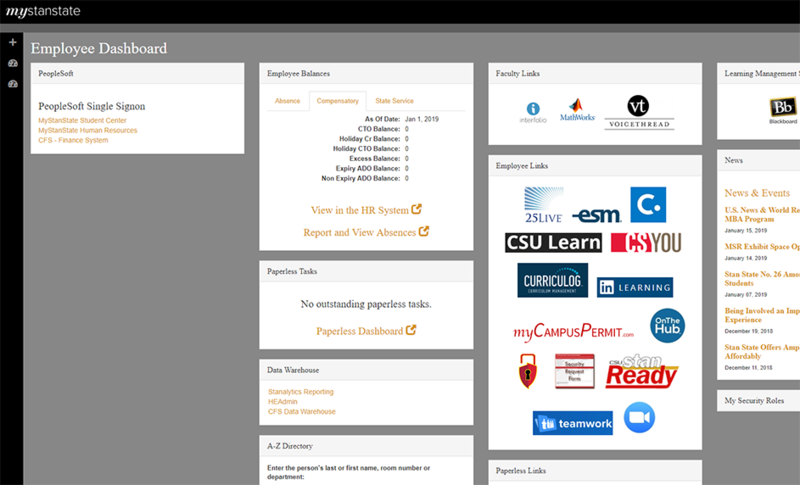 Once you are logged into the MyStanState portal, you can navigate to any of those systems without the need to sign in again. If you keep the MyStanState window open, you can return to the portal page and launch other applications without the need to sign in again, as long as your session hasn’t been idle for more than one hour. There are also a host of new “widgets” on the new portal that were not available before. Students can quickly check their account balance, To-Do lists, holds, and view open computer labs. Employees will also be able to see their sick/vacation time at a glance, their paperless workflow tasks that need attention, view news and emergency notifications along with several other employee specific systems. Anyone can add their own custom dashboard that only they see, and add custom links to other webpages they would like to keep as favorites. More documentation will be coming soon on how to customize your dashboard. Anyone who used the old MyCSUSTAN login page to PeopleSoft Student Self Service, PeopleSoft HR, PeopleSoft CFS, or any other web-system that is single-sign on enabled will be affected by this change. We hope you enjoy using the new MyStanState portal! If anyone has any issues accessing any of the systems in the new portal, please reach out to the Tech Support desk.